"progressive drop in criminal activity in and around these properties in the last two years…. You are contributing in direct and substantive ways to improving the quality of life in that neighborhood." "This outstanding rehabilitation of housing in a blighted area in the historic center of Topeka represents a pioneering spirit and commitment to improving quality of life in a community. Many people doubted this area could be transformed, but Pioneer Group proved what is possible with an innovative and dedicated approach to quality housing." "Congratulations to you, Mr. Freeman, and your associates for designing a community with a social conscience. Your approach to urban development reflects intelligent forethought (on-site community police apartments, neighbors helping neighbors, hiring residents for building and grounds upkeep), humanitarian values (on-site medical clinic, social service programs, transportation, newcomer orientations), and respect for cultural diversity (organized activities, respectful management well-trained in conflict resolution). We are eager to continue our mutually beneficial relationship and are grateful that you have given our veterans quality housing that also provides them with a source for hope, sense of belonging, and tools for success." 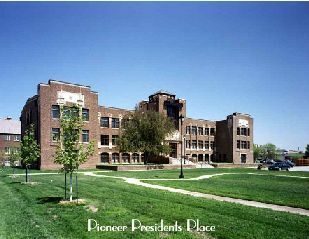 Although the original business focus of Pioneer Group centered on affordable housing, we also found additional development opportunities in historical preservation and federal government Enhanced Use Lease projects.